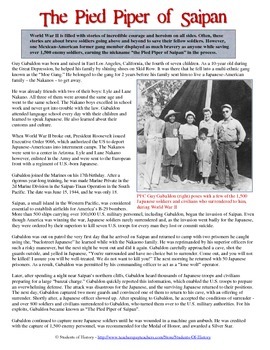 This 1-page Common Core-aligned reading tells the heroic story of a Mexican-American Marine in World War II known as the "Pied Piper of Saipan." This brave soldier overcame growing up in poverty during the Great Depression, gang membership, and having his foster family sent to a Japanese internment camp to become a Silver Star recipient for encouraging over 1,500 Japanese soldiers to surrender in Saipan. This is a great, motivational story for students to read in class or for homework while also bringing in history content like the Great Depression, Roosevelt's Executive Order 9066, and World War II! 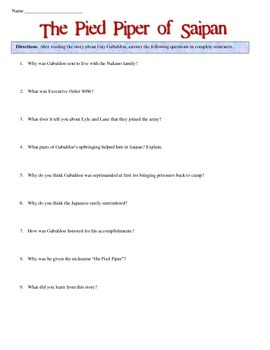 After the reading, a set of 9 comprehension questions are included along with an answer key. 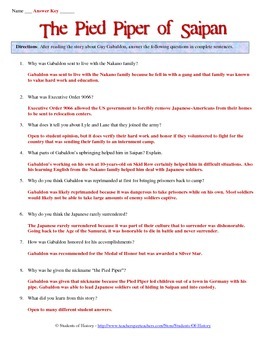 I have used this during Hispanic Heritage Month and during my unit on World War II! Please "Like" my page on Facebook for updates, giveaways, links and more! Thanks!